The other day, I wrote about trying a couple of low-carb recipes. I’m doing the low-carb thing until I can get back to my usual training and performance schedule because it’s an easy way to balance input and output without feeling like I’m starving all the time. In that vein, I’ve decided to try a couple of specifically low-carb recipes that would work for both D and me, since it’s not like I asked D if he wants to give up bread and rolls for the next month. The two standouts thus far in terms of ease of preparation and really nice results both hail from TryKetoWith.Me, the blog of “KetoGirl,” a computer-science student and ketogenic-diet advocate in Chicago. These are two of her simpler recipes, and I chose them because when I looked at them, I didn’t instantly go, “ACK! TOO MANY STEPS!” and click on back to a safer place. No, I’m not making fun of the Safe Spaces concept. I think they play an important role, and they have definitely been helpful to me at times in my life. I mostly just wanted to link to the Safety Dance because it’s hilarious. Because it’s fall and I’m obsessed with putting cinnamon in everything right now, I decided to make sweet-spiced versions of both these recipes—so (because I am apparently out of plain cinnamon … wonder how that happened) I made the waffles with pumpkin pie spice standing in for the optional cinnamon, and I turned the doughballs into mini pumpkin pie spice rolls by rolling the dough out flat, coating it with a blend of Splenda and pumpkin pie spice, then curling it into a long log and cutting it into individual rolls. Not everyone is into sucralose and what have you. It works fine for me, so I use it, but stevia or xylitol would work just as well. Both recipes proved pretty easy to follow—if I was working directly off my tablet or had printed them a little differently, I could have avoided the one mistake I did make, which was the result of my own formatting, not KetoGirl's. Neither required an exhaustive list of ingredients I can't find locally. In fact, I found them all, plus one random extra (arrowroot powder, which I've been meaning to buy forever but always forget about), at a not-particularly-fancy Kroger a couple miles up the road. For both these reasons, and because the end results are delicious, I am happy to issue the Cooking with ADHD Squirrel! of Approval© to both recipes. The only drawback? The whole point of doing a low-carb diet while I'm on the bench is to make maintaining energy balance a no-brainer. The pumpkin pie spice rolls are so freaking good that they might completely torpedo that plan. Cooking with ADHD: Easy Maize Pudding, Coming Up! Just a quick heads-up: I’ll be putting together a much briefer version of this recipe with step-by-step pictures (this post is too long to fit the Cooking with ADHD model!) and probably a video version as well. I should probably also try to come up with a semi-standard, ADHD-friendly format for these posts if I don’t get distracted bef— SQUIRREL! Anyway, yesterday, I woke up with a random craving for hasty pudding/Indian pudding/maize pudding/whatever you want to call it. I looked up a bunch of recipes and became more and more discouraged: most of them involved a bazillion steps, required ingredients that I didn’t have, served 30, and/or took at least two hours* to cook. That’s hasty, my friends — hasty like a sloth. To be fair, that probably was pretty hasty way back in the day when everything was cooked over open flame. **We don’t usually have actual whipping cream hanging around, but proper whipped cream would have been even better. Just saying. So I marched into the kitchen, grabbed the cornmeal from our giant Lazy Susan cabinet thingy, and … hesitated. Perhaps, I thought, Perhaps I should consult Betty Crocker … just in case. So I did, and right there on page 354***, was a recipe for polenta, conveniently labeled fast, which in cooking parlance usually also means easy. ***Pretty sure it’s 354 in my copy of the famous Betty Crocker cookbook, at any rate, but the actual page will vary from edition to edition. It was also labeled low-fat, I didn’t really care about that, but if you’re on a low-fat diet, you’re covered. Those on low-carb diets, on the other hand … um, maybe this isn’t the optimal recipe for you guys. I didn’t make polenta (though basic polenta will definitely be covered win a Cooking with ADHD post). I did make a really easy maize pudding — the polenta recipe just gave me confidence that my intuition about ingredient proportions was pretty much on track. …That’s it. That’s all you need. You could probably even use water instead of milk, though the end product might not be as creamy. Turn on your favorite streaming radio, a YouTube documentary, or whatever you like. If you have a double-boiler: fill the bottom part with water and the top part with the milk; heat over medium-high flame* until the milk steams. If you don’t have a double-boiler: pour the milk into a medium-sized sauce pan with a heavy bottom over medium-low flame* until the milk steams. It might take a while. Add the brown sugar and vanilla to the milk. Add the cornmeal, stirring while you pour it in. You don’t need a fancy whisk or anything; a plain old wooden or nylon spoon is fine. Stir until everything is well-blended, then cover the double-boiler or sauce pan, reduce the flame* to very low — like, as low as possible without actually turning off your burner — and set a timer for ten minutes. While the pudding heats, stir it once in a while to prevent sticking or scorching, but for the most part, leave it alone. After 10 minutes, remove from heat, uncover, and allow to cool for a bit so you don’t blister the roof of your mouth off like I did that one time. Serve hot with whatever suits your fancy. If you’re using the heavy-bottomed sauce-pan method, you’ll have to pay closer attention than you will with a double boiler, since milk scorches pretty easily. You might also want to throw in a little butter or cooking oil to prevent sticking. You’ll notice that the metric equivalents above aren’t exact. Don’t worry about it — in this recipe, all you need to know is that you want a ratio of 1 part cornmeal to 2 parts milk, and even there you’ve got some wiggle room. The rest you can fiddle with according to your personal taste. For example, I’d probably like less sugar, but 2 TBSP was a sound guess for dessert applications. A lot of people don’t have double-boilers. They’re finicky specialized kitchen things that take up a bunch of space, and most of us don’t use them very often. If you’re among the many, though, don’t worry! You can improvise a double boiler from of a sauce pan (or even, in a pinch, a deep frying pan) and a metal bowl that’s just big enough to rest on top of it or inside of it without touching the bottom of the pan. I used to do it this way back before I had access to a double boiler. Here’s a link to an article on improvised double boilers: http://bakingbites.com/2009/09/how-to-make-a-double-boiler/. If you don’t have lids for your sauce pans or improvised double boiler, you can make do by resting a stoneware or Corelle plate, a cookie sheet, a metal mixing-bowl lid, the glass lid from a suitably-sized casserole dish, or any similar flattish, heat-resistant object atop the pan of pudding-in-progress. Just make sure to balance it carefully if you’re using an improvised setup and to use potholders when you lift it off (seriously, I cannot tell you how many times I’ve gone, “Herp de derp, think I’ll just lift this metal bowl lid off with my bare fingEAAAGGHHHHEHEHEH!!!”). In fact, even if you do have lids for your pant, you may find yourself doing this if, for example, they’re all in a disorganized overhead rack and you don’t feel like fighting with them. This dish makes a pretty decent breakfast on a cold morning. For that purpose, I’d recommend making it with less or even no sugar. I like it without any at all for breakfast (that said, I’m not into sweets for breakfast, so your mileage may vary). You can also add things like raisins, dried cranberries, dried cherries, or chopped dates for a sweet, fruity kick (you might want to increase the liquid just a little bit; I’ll report back in my updated recipe post). For a quick and easy savory side-dish, substitute a little garlic and/or onion powder for the sugar and adjust the salt to taste. You can also brown some chopped onions (you can even get them in the freezer section already chopped) in butter before you add the milk or water. For a one-bowl meal, add salty kalamata olives, feta cheese, some fresh baby spinach, and cooked chicken or lamb once the mush cools. Like standard cornmeal mush or polenta, you can even chill this pudding in a loaf pan (or, if you’re me, a plastic container lined with plastic wrap), slice it, and pan-fry it. Pan-seared maize pudding topped with vanilla ice cream sounds pretty good to me. It’s also really very good with real maple syrup. Speaking of maple syrup, don’t be afraid to try the less expensive, darker grades. Darker maple syrup bears a stronger maple flavor, so a little can really go a long way. It’s absolutely delicious on mild-flavored desserts like vanilla or sweet-cream ice cream — or like maize pudding. If I remember correctly, most systems for grading maple syrup in the maple-syrup producing regions of North America date back to a time when maple syrup was used as a substitute for regular cane sugar, which had to be imported at great expense from the tropics. The paler syrups (which are not more processed, but rather are collected early in the “sugaring” season) earned monikers like “fancy” and “Grade A” and commanded higher prices because their subtler maple flavor made them better substitutes for cane sugar. However, the darker grades are absolutely delicious and perfect for those of us who really like a lot of maple flavor but don’t want to have to swamp our food in liquid sugar to get it. Though I grew up in easy reach of the famous Vermont sugaring grounds and their storied produce, I’ve become quite enamored of a local, very dark maple syrup that hails from a nearby part of Indiana. It’s perfect on maize pudding. 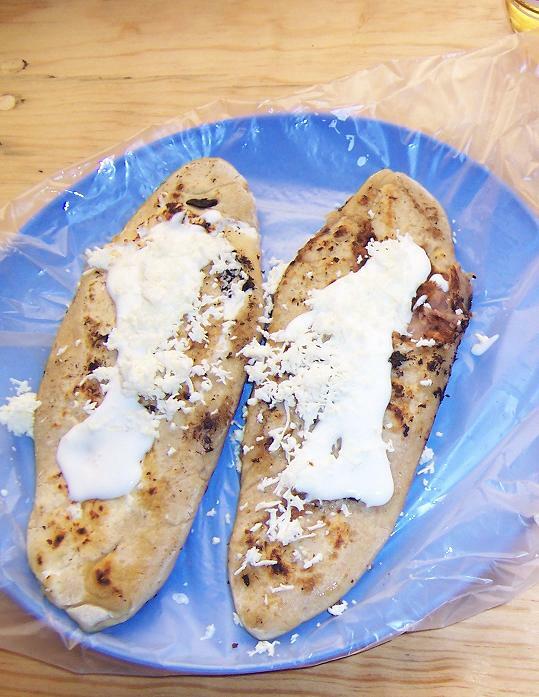 I just discovered tlacoyos, and they look surprisingly doable: mix masa harina with salt and water, flatten into oval shapes, fill with something like beans or ground beef, fold to close, toss ’em in a pan to cook. Fry them if you want; don’t fry them if you don’t want to. Top like you would a taco, or just eat them plain. Sounds good to me! The process doesn’t look like it will require too much prep or cleanup — you don’t need fifteen different bowls and spoons and pots and pans to make these, just a bowl to mix your masa in and a pan to cook your tlacoyos. Toppings can be as easy as prepared salsa and pre-chopped onions (it seems like almost every grocery store In Louisville carries these in their produce section now). I’m betting you can probably make these with regular cornmeal in a pinch (…and being able to do things “in a pinch” is sometimes important when you’re working around a condition that interferes with executive functioning). In fact, I think I’ll try them that way first. I already have everything I need to make them that way. You can easily make your tlacoyos kosher, halal, dairy-free, gluten-free (though some kinds of cornmeal do contain gluten), vegetarian, vegan and so on. They’re really versatile, and that’s a great thing — especially if you’re looking for something to cook for a crowd of friends who might bring different dietary challenges to the table. I plan to add these to the first set of test recipes for Cooking with ADHD. They might even be first on the field, because I can’t wait to try them. I’ll probably make some with just mashed beans (the disorganized cook’s answer to refried!) and some with my favorite meatless taco filling, which combines mashed beans with red rice (brown or white rice work fine, too, it just happens that I bought an enormous bag of red rice a while back and don’t eat rice all that often). I’ll do them again with proper masa harina (also widely available in US supermarkets and on Amazon) if it turns out that they’re as easy as they sound. I’ve finished one of my academic classes, and the other one has only two weeks left (HALP!). I figure that means it’s about time to start working on Cooking With ADHD. Amazingly, my project exploring ways to simplify cooking for those of us who are (among other things) planning-challenged begins with a plan. Ironic, amirite? So here’s the plan. I’m going to start by testing a few recipes myself and asking my friend Robert to test them as well (if you’d like to suggest or test ADHD-friendly recipes, let me know! The more, the merrier!). Sometimes this might mean sticking to the basics; sometimes it might mean using ready-made blends (like “apple pie spice” or “taco seasoning”) instead of buying and blending lots of individual herbs and spices. The shorter the list, the less stressful it will be to work through it without the fear of skipping something important (like flour — remind me to tell you about the time that I read the ingredients list for a cookie recipe three times to make sure there really wasn’t any flour, only to discover that I was wrooooooong). Accessibility is also important. While I love all kinds of exotic flavors, I’m not going to create an ADHD cookbook that assumes we’re all organized enough to go find the rarest Golden-Crested Phoenix Eggs or Celestial Foofoo Stamens (PS, I’m not actually picking on saffron … much ;)). Likewise, I don’t want to incorporate a lot of stuff that’s going to be used once or twice, then sit around cluttering up the spice rack. Instead, the idea is to develop a small stable of versatile spices that can transcend culinary borders. The best ADHD-friendly recipes will come with short sets of one-line-at-a-time instructions. Others, we’ll have to modify for usability. This may be the most important thing. This isn’t to say that I won’t include a few more complex recipes for special occasions — but everyday recipes don’t need to read like aircraft-assembly instructions! The fewer steps there are between concept and implementation, the better the results are likely to be. Even with meds, I am not sufficiently organized to own an actual food processor. This means that I don’t make anything that requires one. The idea is to test recipes using pretty basic technology — an oven, bowls and spoons, a spatula, knives, a whisk or two, a hand-powered egg beaters, pots and pans. I own a proper fancy stand mixer, but since I can’t lift it down from the top of the fridge, I don’t use it. Folks who have things like food processors can use them to speed up some of the steps; I’ll try to include sidebars for things like that whenever possible. The less stuff we have to buy, store, find, use, and clean, the more successful we’re going to be! Poached eggs! Can these possibly truly be ADHD-friendly? I guess we’ll find out! The fact that you poach them in their shells means you can make a bunch and pop them back in the fridge to eat later, just like you would with hard-boiled eggs. I’m pretty sure this one will fit the bill. I make roasted chicken all the time. It looks impressive, but it’s easy, and you can walk away from it for an hour and a half or so in the middle, which makes it a great thing to prepare for company. These don’t really need a recipe; people just need to know that they’re even possible. My Mom taught me how to make them last time we visited her and my Step-dad, and I don’t really know how I’ve survived this much ostensible adulthood without them. So there we have it — the first five recipes. I’ll also include some veggie instructions so these can be made into full meals. Edited for clarity and to clean up some messy code that always shows up when I type these on my tablet. Tags: cooking with ADHD, recipes to follow, squirrel! I’m a fan of abusing the waffle iron and/or the Foreman grill. Basically, I feel that if it’s relatively flat and you can bake it, you can probably iron it, too — and ironing it will take less time and won’t make your house stiflingly hot in the summer. Imagine, then, my delight at discovering the “Will It Waffle?” blog. A gentleman called Dan has written an extensive blog and now an entire book about cooking things with a waffle iron — things like pumpkin custard (yes, please) and mashed potatoes (sure, I’ll try that, too!). Some of his recipes are on Serious Eats, and you can find his book on Amazon and in local bookstores. A lot of Dan’s recipes look pretty ADHD-friendly: by necessity, anything you’re going to waffle is something you’re probably going to be able to mix up in a bowl, and since waffle irons don’t really support complicated cooking techniques, the cooking part should be pretty simple, too. Likewise, while I haven’t seen his book, an unscientific sampling of the recipes on the blog (check out the Blog Archive) suggests that the whole concept is pretty ADHD-friendly. Check out Waffled Cornbread, for example: 7 ingredients, 4 steps, printable on a single sheet of paper. No page turns! That’s important. I don’t know if this is true for everyone with ADHD, but a recipe with a page turn is much harder for me than one without (especially if the page turn comes at some critical point in the instructions and requires me to flip back and forth). In a similar vein, Dan’s blog led me to Sheet Pan Suppers, another collection of recipes that doesn’t leave the beleaguered household cook with a million dishes to do on Thursday night. That’s a big win right there. I’m trying to expand my repertoire of weekday-evening meals (because while I’m happy with a constant rotation of protein, salad, potato or bread, Denis isn’t), and Sheet Pan Suppers looks pretty promising. Some of the recipes involve slightly more complex instructions, but quite a few of them have only a few steps that don’t read like paragraphs. Pretty cool stuff. I plan to begin exploring this book once we’ve eaten up all the leftovers from the Family Holiday Shindig (which went brilliantly well). I’ll need to pick up a half-sheet pan. Bizarrely, we don’t own one — Denis likes to bake cookies on pizza stones, and I’ve been meaning to buy a half-sheet pan since I moved in and still haven’t done so. Instead, I’ve been muddling through, substituting rectangular cake pans when I’ve really needed to roast something that would work better on a sheet. Since I do all the cooking, it seems reasonable to acquire tools that work for my work style and maybe get rid of some of the ones that don’t (because, seriously, we have a ton of kitchen stuff I don’t use, ever). I’ll report back on Sheet Pan Suppers as I begin to use it. In other news, I’m still recovering from Winter Plague #2, but I’m mostly human again now. I still have a lingering cough that sounds a bit croupy, so I’m not really back in action bike-wise yet. Ballet resumes a week from Monday, so I will be able to spend the next week bringing myself back online exercise-wise using the dreaded Ballet Conditioning Workout and Bollywood Burn.